I got my ZEAM from a friend named Chalie, he is a student from Denmark. He and his friends, Walther, Harriet and Nathan came to Thailand to complete their field trip, I and another young man named Joel were their interpreter. There were some good and bad times that we had been together while we were in the field far away from the civilizations. We experienced how local people lived in such a remote area. We had been trekking through the mountain to visit Karen Refugee Camp and Rokkanee where Mon tribe are now living. It was a really beautiful experience and ZEAM that I received from him can fully represent our friendship we have. Thanks so much, I just love it!! It's cool mannnnnnn. 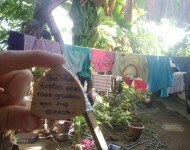 From Nicaragua to Denmark to Thailand!! Alright my turn! Ill take care of this baby for a little while and drop it off somewhere in Thailand! viel zu viele eindruecke, als dass ich sie jetzt alle niederschreiben kann. die hinreise war chaotisch und anstrengend, aber jetzt bin ich da und lasse mich auf die kultur und die menschen ein.